Instagram has made it as difficult to access the majority of their features outside of their mobile app. When you’re out and about, this isn’t a problem, but it can be inconvenient when you’re sitting at home on your computer. 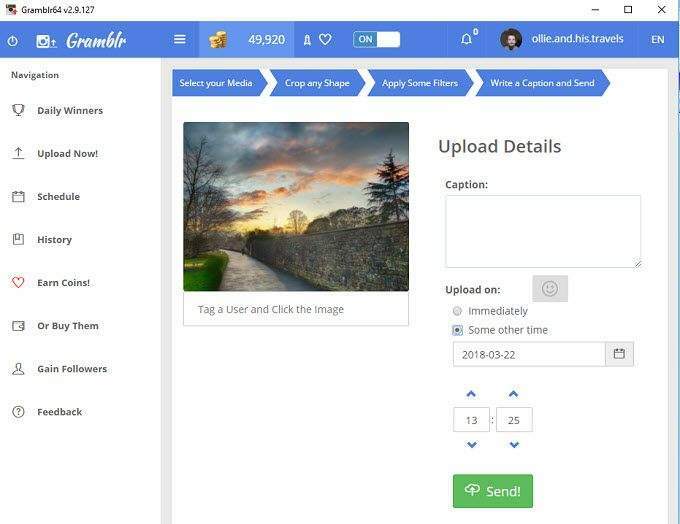 This app can be a useful way to upload new photos and videos straight from your desktop, but it’s also very powerful for growing your follower count and engagement thanks to a number of different tools. We’ve taken a look at some of the biggest reasons why Gramblr is one of the best desktop PC clients for Instagram below. Before you click the upload button, you can go through a number of steps to touch up your photo. These steps are similar to what you’d find on the Instagram app. This includes adding a variety of Instagram filters and a selection of Gramblr exclusive filters. After you’ve edited your photo, you can add a caption, add a location, include hashtags, and then click post. Interestingly, you are given the option to add 60 likes from real users immediately to your image. More will be explained on this below. There are many Instagram post schedulers on the internet, but nearly all of them don’t actually automate the posting process. Instead, they push the photo and caption to your phone at a certain point and you’re then forced to manually upload it. This is due to some restrictions Instagram has made to stop users from automating posts with third party tools. Thankfully, this isn’t the case with Gramblr. With Gramblr, the client essentially hooks straight into the Instagram API to post images on your behalf. This means that so long as the Gramblr client is up, any scheduled posts you’ve set will automatically be posted at the scheduled time. 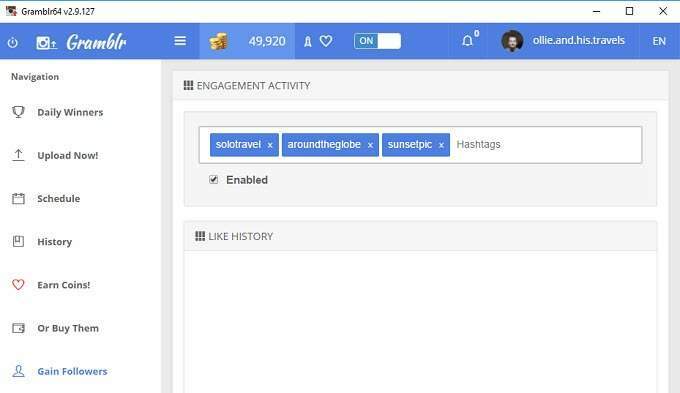 Because of Gramblr’s workaround, it also has a number of other automation tools that can be beneficial for growing your Instagram account. One such tool is an auto like feature. With this, you’re able to automatically like pictures on Instagram to grab the attention of new users. You can choose photos with specific hashtags so that you’re always targeting a specific audience. After that, you can press ‘auto-like’ and as long as the Gramblr client is open, your profile will automatically like new posts. You are also able to boost each post you make with Gramblr. You’re given 60 free likes and regularly get free coins that can be spent on more likes. You can also pay for coins to get likes. 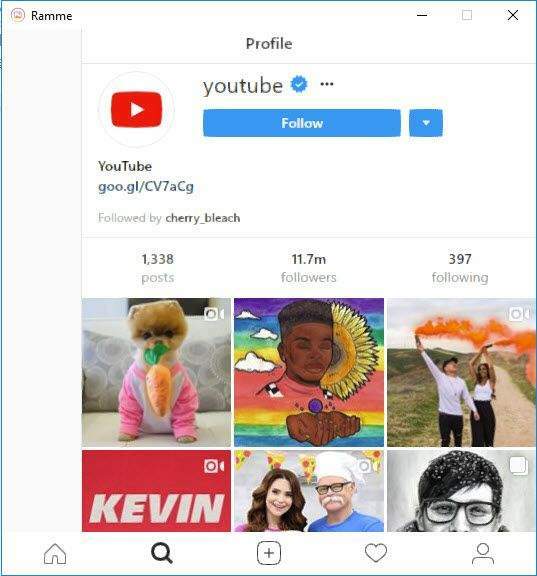 Gramblr claims that these likes are from real users. All Gramblr users can gain coins by liking those in the ‘earn coins’ queue. By liking another user’s photo, you’ll get 5 coins, and you can add a like on your own photo for 10 coins. Gramblr is a great Instagram client, but it doesn’t come without issues. Firstly, the client rarely gets support or updates and the developer is very hard to get hold of. Secondly, the features that Gramblr uses are technically against Instagram’s terms of service, but because Gramblr goes straight through Instagram’s API, the auto like, post scheduler, and like boost feature sit in a gray area. There’s some concern over whether using Gramblr’s marketing tools too much may place restrictions on your account or ban it completely, so it’s something to consider before using it. 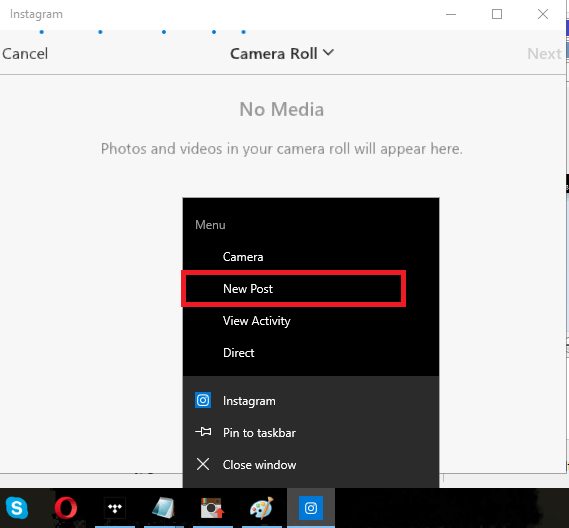 Windows 10 now features an Instagram app that gives you many of the features that the mobile application gives you. It’s free to download and very lightweight. You can download it by visiting the Microsoft Store on your PC. Because it’s tied into Windows 10, notifications will pop up on your display and be sent straight to your action center. 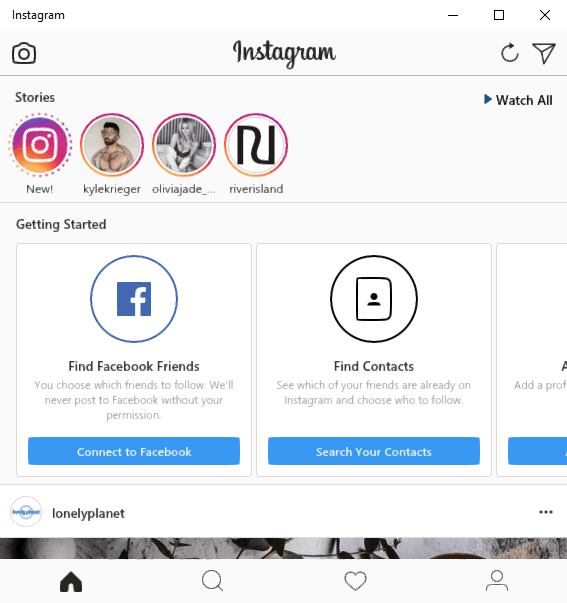 Below, we’ve provided an overview of the Windows Store Instagram app and how it compares to the desktop website. One of the main reasons why the Windows Store app is better than the desktop website is the included option for adding photos and videos. When you visit the desktop website, you’re not able to upload new posts. Logging in can also be a pain. Sometimes, you’ll struggle to get past the login screen – it just stalls after entering your password. When you do get in, you’ll find the experience to be a treat, for the most part. Ramme is a lightweight desktop app that signs you into an experience that’s practically identical to the Instagram iOS application. You can download Ramme from github.com. There are a number of reasons why Ramme stands out when compared to the desktop version. Firstly, all functionality from the mobile app is present and exactly where you’d expect it to be. That includes photo uploads, stories, and direct messages. Below we’ve provided a look at some of the key points worth mentioning with Ramme. With Ramme, you just need the .exe file from the GitHub page and you’re good to go. There’s no need to go through an installer or visit the Windows store like you do with Gramblr or the Windows Store app. This makes it easy to store Ramme on a USB stick or download it to use temporarily on a shared computer. Ramme is very lightweight and runs smoothly too, and you’ll rarely come across any performance issues. It’s also possible to resize the Ramme window on your desktop and everything on the screen adjusts to fill the window size without any hiccups. The upload process on the Windows Store app is a little odd and uploading images on the desktop website isn’t possible at all. With Ramme, uploading uses the same process seen on the mobile app. You simply click the ‘+’ icon at the bottom and then browse through Windows File Explorer to find a photo or video to upload. We don’t have much bad to say about Ramme, so long as you’re happy to sign in through an app that’s not officially endorsed or created by Instagram. 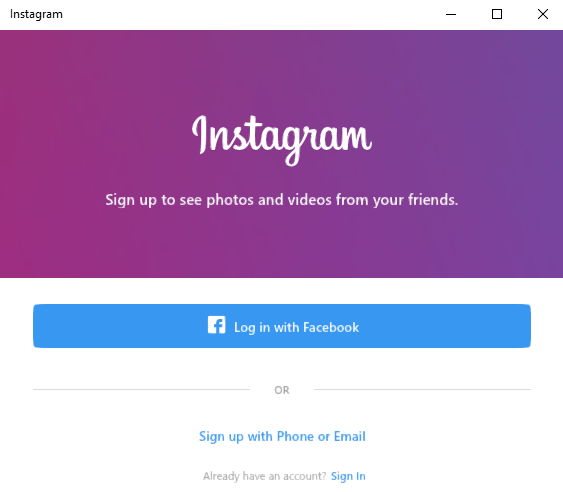 The post 3 Top Apps for Using Instagram on Your PC appeared first on Online Tech Tips. Screenshots are a great way to capture whatever is on your screen and store it for later use. Sometimes you need to capture a screenshot to remember a password or capture some other pertinent information that you can’t save otherwise. 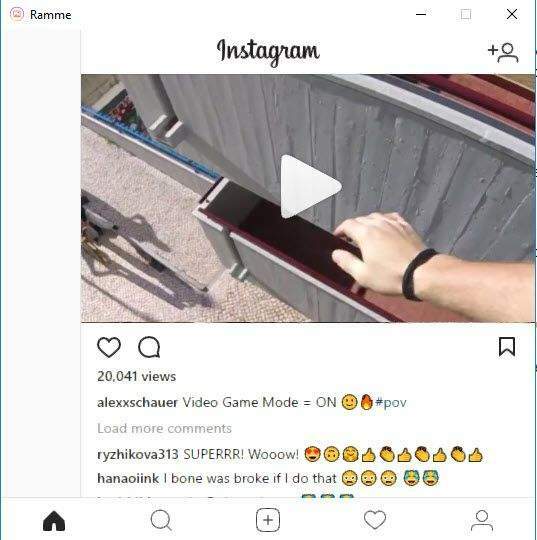 Other times you need to capture a screenshot and send it to someone else so that they can help you or see what you were doing. Finally, you may want to capture multiple screenshots over a certain time period so that you can see the activity occurring on the computer. In this article, I’m going to show you how to use a free program to automatically capture screenshots of your computer screen at specified time intervals. Auto Screen Capture is an open source utility on SourceForge that has quite a few options for capturing screenshots on your Windows machine. The program works with Windows Vista and higher, including Windows 10. The good thing about the program is that it doesn’t even require you to install it. All you have to do is download the EXE file and run it. This is great because it doesn’t add anything to your registry or copy files into your system directories. When you run the program, you’ll see the main interface is split up into a couple of different sections. At the top left is a calendar and below that are the main settings for the program. On the right-hand side, you have previews of each screen connected to your computer. If you only have one monitor, you’ll only see the preview for Screen 1. By default, the program is set to Demo Mode ON and Schedule Off. This means that when you open the program, the main interface will show up so that you can configure the options. The first thing we want to do is change these settings. Click on the Options button at the very bottom left and then click on Turn on demo mode at application startup to uncheck it. Click on Turn on scheduled screen capturing at application startup to check that option. The rest of the options are self-explanatory. If you are trying to capture screenshots stealthy, it’s a good idea to uncheck Open this window at application startup, Open this window after stopping the running screen capture session, and Show the slideshow after stopping the running screen capture session. You can also store the screenshots on any drive connected to the computer, including network drives. This is great if you want to install the program on several computers and have all the screenshots saved directly to a server, NAS, etc. On the Screen Capture tab, the top section controls how often the screenshots will be taken. By default, the program is set to take a screenshot every second, which is a bit ridiculous. If you don’t want all the space on your computer gone in two days, change the timings to something more reasonable like every 30 seconds or every 2 minutes. I would keep Initial capture checked as that includes an additional screenshot of the active window. The program will create two folders for each day, one with a screenshot of the full desktop and one with a close up of wherever the mouse is located at the time of the screenshot. This is a cool little feature that lets you see the screen in more detail only for the active section of the screen. Also by default, the program is set to stop after 30 minutes, so if you want screenshots taken continuously or for a longer time, either uncheck the Limit box or type in a higher value. Finally, the Resolution box is set to 100% by default, but you can adjust this setting if the files are too big. If you scroll down, you’ll see you can also set a schedule for taking screenshots. If you want the program to automatically start taking screenshots, rather than you having to manually start the capture process, check the Start capture at and Stop capture at boxes. Screenshots will only be taken during that time period at the time interval you specified above. Finally, if you scroll down a little more, you can change the image type to something other than PNG. You can choose from BMP, EMF, GIF, JPEG, TIFF and WMF. In my opinion, the best option is JPEG as it will give you the best quality with the smallest size. In my tests, a full desktop screenshot at 2560×1440 was about 160 KB. If I used the PNG format, the same screenshot was a whopping 1.7 MB! Click the Start Capture button to start the capturing process. The program should disappear into the taskbar, where it will remain while taking the screenshots. Unfortunately, the best thing you can do to hide it is put it inside the overflow section in the notification area. This program wasn’t created with any kind of stealth mode or anything like that, so if you need discreet screen recording software, this might not work for you. Once some screenshots have been taken, you can easily view them by going to the Slideshow tab. If you don’t want to view the screenshots in the program, you can also just browse through the folder using Explorer. In my case, the top level folder was the date and then inside I had a folder named 1 and a folder named 5. One contained full-desktop screenshots and the other contained close-ups. It’s also worth noting that if you are using Windows 10 with multiple virtual desktops, the program will capture a screenshot of only the active desktop at that time. So if the user switches to desktop 3, you’ll get a screenshot of desktop 3. If they switch back to desktop 2, then you’ll get that desktop in the next screenshot. Finally, if you click on the Keylogger tab, you can set the program to record all keystrokes while the program is running. Just check the Enable keylogging while screen capturing box. The file will be stored in the same location as the screenshots. The keylogger is pretty nice in the sense that it actually lists out the program where the keystrokes were recorded. This helps you make sense of all the text in the document. Overall, the program works really well, considering it’s free of charge. It only works on Windows, but that should be fine for most people. If you need screenshots at set time intervals, this is the best program for the job. Enjoy! The post Capture Screenshots at Defined Time Intervals Automatically in Windows appeared first on Online Tech Tips. Have a ZIP file that you can’t get into because it has a password on it? If you forgot the password, the only option you have is to try and recover the password using third-party utilities. Depending on which program created the ZIP file (7-Zip, WinZip, etc.) and what type of encryption was used, your chances of recovering the password will vary. In this article, I’m going to mention a couple of tools that I’ve used to recover a ZIP password on some test files that I created. Hopefully, you’ll be able to access your ZIP file by cracking the password using one of these tools. It’s worth noting that if the ZIP file is encrypted using AES 128-bit or 256-bit encryption, your only option will be a brute force attack. If the password is very long, you’ll need a really powerful computer to process as many passwords per second as possible. Also, be sure to check out my other posts on opening password protected RAR files, cracking XLS passwords, resetting Windows administrator passwords, and resetting BIOS passwords. In my opinion, Elcomsoft Archive Password Recovery is the best choice for recovering a password from an encrypted ZIP, RAR, ACE or ARJ archive. The software comes in two flavors: Standard and Pro. The Standard version is $49.99 and the Pro version is $99. The main difference between the two versions is that the Pro version supports WinZip archives that use enhanced AES encryption and guarantees WinZip recovery with some limitations (must be WinZip 8.0 or earlier and the archive has to have at least 5 files). In addition, it has an additional method of recovery called Password from keys that can be used in addition to brute-force, dictionary and plain-text attacks. What I like about this program is the number of different methods you can use to recover the password and the different options you have for each method. The toughest situation is when you have a password and you don’t know the length or what kind of characters are included. In these types of situations, you should start with the faster methods before moving on to attacks that will take much longer. Once you download and install the software, you’ll see the main interface as shown above. To get started, click the Open button and choose your archive file. By default, the Type of Attack is set to Brute-force and the options that are checked include all capital and all lowercase letters. Before you click Start, you should go ahead and click on the Benchmark button, which will check the type of encryption on the file and give you an estimate of how long it will take using the current options. As you can see, it will take about 11 minutes to recover a password that was encrypted using AES 256-bit and by only looking at lowercase and uppercase letters with a maximum password length of only 4 characters. If you choose All Printable characters, the time went up to 2.5 hours in my case. Again, this is only for a short four-character password. The time goes up exponentially as the password gets longer. If you’re not sure how long the password is, click on the Length tab and increase the maximum password length to something higher. The trial version only works up to four characters. Obviously, if you have no idea what the password is, checking All Printable and then increasing the length to 10 or higher will guarantee you more success, but it might also take way too long. I suggest starting with only letters up to a higher character count and if that doesn’t work, then add All digits and All special symbols one at a time. Before you start with a brute-force attack, it might be worth trying a dictionary attack first as that will take less time. Choose Dictionary from the drop-down and then click on the Dictionary tab. The program comes with a small, but decent dictionary already built-in. The nice thing is that you can download bigger dictionaries online and use them in the program if you want. Of course, this won’t work if someone used a complex password, but it’s worth a shot since it’s much faster. Another thing to note is that the whole archive can be decrypted if you happen to have one of the files that are inside the archive. This probably won’t be the case most of the time, but if you do happen to have at least one file that you know is inside the archive, you can use the Plain Text attack to decrypt the entire archive. Also, if you happen to know the length of the password and anything else about it, you can use the Mask attack. For example, if you know the password starts with x and is 7 characters long, you would enter x?????? into the Mask box on the Range tab. Overall, this is an excellent program and definitely worth the cost if you need to get into a ZIP or other archive file. On my test file with a short four-character passcode and 256-bit AES encryption, it worked flawlessly and got me the password in just a few minutes. The main thing is to run the program on the fastest computer you have around. The more passwords than can be tried per second, the faster you’ll break into the file. The other good program that I recommend is Passware Zip Key. The program is only $39, which is a bit cheaper than Elcomsoft. They also have a demo version, but it only runs each attack for one minute, so you really can’t test to see if it works, even on a short password. However, I purchased it so that I could test it and it worked fine. It’s very similar to Elcomsoft in terms of the attacks, etc. Once you install it, click on Recover File Password and then you’ll see the options below. You can choose Run Wizard, which will let you pick from different options if you happen to know anything about the password. This is good if you know the password only contains letters, etc. If you click on Use Predefined Settings, it will start with some simple attacks and then automatically move on to more complex attacks. If you click on the Attacks tab at the bottom, you will be able to see all the attacks that will be tried. Some attacks will take longer than others, again depending on the password length and encryption type. Brute force is the slowest method, so that’s why the programs tries other methods in-between. Lastly, you can choose Advanced: Customized Settings and basically configure everything manually like how the Elcomsoft program is setup by default. You choose an attack from the list and then click the left arrow button to add it to the queue. You can add several attacks and they will run one after the other. In my case, I choose a brute force attack with a four-character password that contains letters, numbers and symbols. It didn’t take long for Zip Key to crack my test file, which is the same one I used for testing Elcomsoft. If you plan to purchase Zip Key, please do it using this purchase link. The price is the same, but I get a small cut for recommending the program instead of the company getting all the money. Thanks! There are a lot of other programs out there for cracking ZIP files, but these are the two that I really liked in terms of ease of use, features and actual ability to recover the password. If you have used something else, feel free to let us know in the comments. Enjoy! The post Unlock Password Protected Zip Files appeared first on Online Tech Tips. A great way to save yourself from viruses, malware and spyware is to use a virtual machine to browse the Internet instead of your regular Windows PC. So what is a virtual machine? It’s basically a full copy of Windows that runs inside another copy of Windows called the host. The virtual version of Windows is just a large file and special software running on your Windows computer (virtualization software) acts as a fake computer so that Windows can run. Anything you do in the virtual machine will not affect your host operating system. So you could download 10 viruses onto the virtual machine and your main operating system would be safe. What’s nice about virtual machines is that you can reset them. So if you get a virus while browsing in the virtual machine, you can simply reset the virtual machine to the default state when you first installed it and start over. It’s also a great way to increase your privacy because you can simply erase anything you’ve done in a virtual machine. Disk2VHD – A free tool from Microsoft that will be used to convert any Windows operating system from Windows XP onwards into a virtual machine file. Windows 8.1 Pro or Windows 10 Pro – You’ll need the Pro versions of either Windows 8.1 or Windows 10 in order to complete this process. Both operating systems have a tool called Hyper-V that can be used to access the virtual file created by Disk2VHD. It’s also worth noting that even though you can use Windows XP, Vista and 7 as the virtual machine, it’s best if you can convert a Windows 8.1 or Windows 10 machine because the highest resolution that Hyper-V supports for those older operating systems is 1600×1200. It’s really annoying and I don’t know why Microsoft hasn’t bothered to fix this issue yet. Anyway, it’s only a problem for those with high resolution monitors. Let’s start with the easy part: converting your current version of Windows into a virtual machine (VHD or VHDX file). To do this, download the Disk2VHD tool mentioned above and run the EXE file. When you run it, you’ll see a screen like the one above. There really isn’t much you have to do here other than choose the location where you want to save the VHDX file and which volumes you want to include. If you have a large hard drive, you can just let it save the file to the same partition as Windows. If not, choose another location like a second hard drive or an external USB hard drive. By default, it’s going to select all of the volumes it finds on your computer, which may not be want you actually want. In my case, I have several hard drives connected to the computer, so I only want to select volume C:, which is 37.26 GB in size. In addition, you want to make sure to select any other volumes that were created when you installed Windows, most likely the Boot volume and System Reserved volume. These are usually really small: in my case, the System Reserved volume is only 34 MB and the other volume, which has no label, is only 322.08 MB. It’s very important that you select these other volumes in addition to the main Windows volume because if you don’t, the operating system won’t boot when you load it into Hyper-V. Instead, you’ll get a Boot Failure message! This is because those two extra volumes tell the system where Windows is located and how to boot it. It will probably take some time to create the VHDX file depending on how big your Windows partition is. Once finished, you’ll have one really large file and two smaller files. Next, we have to install the Hyper-V tools in Windows 8.1 or Windows 10 Pro. If you have the Home editions, you’ll have to upgrade to Pro before you can install Hyper-V. Click on Start and type in windows features. At the top, click on Turn Windows features on or off. A window will appear where you can check off extra items you want to install. Go ahead and check the box for Hyper-V. It should automatically check the boxes for Hyper-V Management Tools and Hyper-V Platform also. Click OK and let Windows install the features. You will also have to restart your computer. Once you boot back up, click on Start, All Apps and then scroll down to Windows Administrative Tools. You should see Hyper-V Manager listed there. You can also just click on Start and type in Hyper-V to search for it. Now for the fun part! Let’s get started with Hyper-V. Go ahead and open the Hyper-V Manager and you’ll see a blank workspace. At the far left is the server, which should be the name of your computer. In the middle section are the list of virtual machines and checkpoints. On the right, you have a dynamic menu that changes depending on what item is selected in the left-hand sections. To get started, select the computer name at the far left. Now at the far right, click on New and then Virtual Machine. This will bring up the new virtual machine wizard. The first step is to give your virtual machine a name. Next, you have to choose the generation for the virtual machine. If you are converting a 64-bit version of Windows to a virtual machine and your computer hardware supports UEFI, go ahead and choose Generation 2, since that allows for more advanced features. Use Generation 1 for 32-bit versions of Windows or if your machine is using legacy BIOS. Generation 2 also supports wide-screen displays when virtualizing Windows 8.1 or Windows 10. If you have no idea what all that means, just choose Generation 1 to be on the safe side. Note that if the virtual machine fails to boot, you can easily just delete it and start this process again. Select a different generation and see if it boots up properly. Deleting the virtual machine inside Hyper-V does not delete your original VHDX files. On the next screen, you have to choose the amount of memory you want to assign to your virtual machine. I left it at the default value of 1024 MB, but you can increase it if you have enough RAM available on your host machine. Go ahead and skip the Configure Networking screen for now because we will have to do that later. For now, just leave it at Not Connected. On the Connect Virtual Hard Disk screen, you need to select Use an existing virtual hard disk. Click the Browse button and select the VHDX image that represents your actual Windows partition. This should be the really big VHDX file. We will have to manually add the other two VHDX drives after the wizard, which I will show further down. At this point, review the summary and click Finish. Now you should see a new item listed under Virtual Machines. If you click on this, you’ll see a bunch more options in the right-hand pane also. To start the virtual machine, select it and then click on Start. The State column will change to Running. Next to view the virtual machine, click on Connect. If you did this now, you’ll see that error message that I mentioned at the beginning of the article: Boot failure. We still need to add the other hard drives. Select the virtual machine and click Turn Off. Then click on the Settings link. On the left hand side, you should see IDE Controller 0 and IDE Controller 1. Click on the Controller 0 first. If you chose Generation 2, you will see SCSI Controller only. You will see that the first VHDX file we added in the wizard is already listed. Now we have to add the second and third files. Make sure Hard Drive is selected and then click Add. The Location box should automatically choose 1 since the 0 slot is taken by our first VHDX file. Each IDE Controller only has two slots available for adding drives. Click Virtual hard disk and choose your second VHDX file. Now click on IDE Controller 1 and then click the Add button again. Do the same thing here, but choose your third VHDX file. Now that we have all three VHDX files attached, we can click OK and start up our virtual machine. This time you should hopefully get a screen with Windows loading! Lastly, we need to setup networking for the virtual machine so that you can connect to the local network and to the Internet. To do this, click on Virtual Switch Manager at the top of the right hand menu. Click on New virtual network switch and then select External from the list box. Finally, click on Create Virtual Switch. Give your virtual switch a name if you like and then choose the correct network from the dropdown box. If you have more than one network card, choose the one that is connected to the network and Internet. Once your switch has been created, we need to tell the virtual machine to use it. To do that, click on the virtual machine in Hyper-V manager and then click on the Settings link in the right pane. Click on Network Adapter and then choose the new virtual switch that you created in the previous step. That’s it! Now when you start up your virtual machine, it should get network access via the host computer. Hopefully, this article helps you take your current PC and convert it into a virtual machine that you can run on the same PC or another PC if you like. There are lots of things that can go wrong in this process, so feel free to comment if you run into problems. Enjoy! The post Convert a Windows PC into a Virtual Machine using Hyper-V appeared first on Online Tech Tips.